Is it a fitness/activity tracker or a smartwatch? I am not sure. But the new Microsoft Band looks promising. The Microsoft Band 2 comes in 3 different sizes. It has a curved glass display protected by Corning Gorilla Glass. The band is flexible and the design does not have any hard edges. It is designed to curve nicely around the wrist. It has inbuilt GPS tracker. It monitors the UV levels. It has guided workouts, sleep tracking, calorie tracking, etc. It 11 sensors which includes Barometer to sense elevation changes. It is deeply integrated with Cortana. Cortana in the Band can tell you if have missed a workout. It even has a mechanisim to measure the max oxygen your body can process in a min. That is called the VO2 max. It is used in advanced training for sports persons and now it is available for any Microsoft Band 2 user. If you decided that it is a fitness tracker, the Band 2 can give you notifications from your mobile. It can sync up with any smartphone running on Android, iOS and ofcourse Windows. So is it a Smartwatch? I think its a Hybrid watch. Availability and pricing in India is not yet known. But in the US, it retails for $249 and is available from october 30 this year. The wearable market is slowly, but steadily gaining momentum. I liked Huawei Talkband, the convertible wearable from Android. Now Huawei has introduced a new wearable at the IFA and its simply called Huawei Watch. It is also the first smart watch from Huawei. The Watch resembles a traditional watch. The design features can be customized and the price starts from €399.00. It runs on Adnroid Wear. It can connect with your mobile and show you all the notifications. It also has a feature to locate a lost mobile. With the latest version of Android wear, the Huawei Watch can connect to both Android and iOS mobiles. It is 42mm in diameter and is available in rose gold, stainless steel and black frames. Also the straps are available in stainless steel mesh, stainless steel links, rose gold, and black-plated stainless steel links, and brown and black leather. The watch display is 1.4 inch AMOLED display protected by sapphire crystal. It has heart rate monitor and 6 axis motion sensors to track activities and intelligently identify the type of activity. Pricing and availability in India is not yet known. Xiaomi is known for their quality products and value for money proposition. In those lines, Xiaomi have introduced the Mi Fit Band, a fitness band to track your fitness and sleep activity. The product is available only in China and there is no update on its availability elsewhere. The official price of this device is about 12$. At this insanely low price, this fitness band offers features similar to a 100$ Fitbit Flex. The Mi Fit is a very light fitness band. The band is made of flexible rubber and is available in multiple colors. The tracker fits in neatly within the band and it is easily removable also. The tracker has a metal finish face on the top with 3 LED lights and a MI logo at the bottom. The band is secured with a similarly designed metal cuff. The tracker is waterproof. The Fitbit flex also has a similar design, but the band is made of 2 separate pieces joined in the center with a plastic piece. Because of this joint, the band tends to break over usage. My Fitbit band broke within 3 months of regular usage. (Fitbit send me a replacement with no questions asked, which is a different story) The Mi Fit band is much more robust and the design is slim and neat. The MI Fit syncs with Android App on your mobile. It works well with any Android phone and not necessarily a xiaomi android mobile. But certain features like Unlocking the phone, works only on a xiaomi phone. Watch the video below to see how it works. The step count is not very accurate. But then I had the same error percentage with Fitbit flex. It serves as an approximate measure of your walking and jogging activity, which is good enough and can be forgiven because of its price. The Mi Fit app is a very basic fitness tracking app. Once paired, it syncs with your Mi Fit when the app is opened. There is no real time background sync, which is good in a way, because it saves a lot of battery. There is no web app to see the track record. However your record is sync with your Mi Account and when you change your mobile and pair the band, you get back all your old data. One major drawback is the inability to collaborate with other users. Fitbit was great in that department. Fitbit app can sync my data with multiple applications and I can track my friends’ progress as well. That was a huge motivational quotient. With the Mi Band all you can do is to share your day’s progess as a screenshot in selected social network. The face of the tracker has 3 LED lights and it shows your progress. However the gesture to show the progress is quite a task to master. Unlike Fitbit, it is not activated by tap. You have to swing your hand and bring it in front of you to light up the progress LED. Check the video below to see how it is done. The band when paired to your mobile will vibrate if you receive a call. Apart from step counting, the band can count your fitness workouts like jumping ropes and sit ups. You can also set an alarm on the app and at the appointed time, the band will vibrate. These are few little features which I found very helpful. Also I was surprised that a 12$ band could do all these tricks. The battery is another marvel. Xiaomi claims that the device can run upto 30 days on a single charge. But it has been 38 days since I charged my band and still have 43% of power left. I bought my Mi Fit band from Tinydeal and here is a link below. It is also available in eBay india with some sellers. Will.i.am has a flourishing career as a musician and lead artist of the Black Eyed Peas band. That is just one side of him. He is also a serial entrepreneur. While this DNA is not uncommon among celebrities with loads of cash on them, Will.i.am has actually made a sensible product from his start-up company called i.am+. This wearable smartwatch is called PULS and it is more than just a watch. It has its own SIM card and is totally independent of a mobile phone. 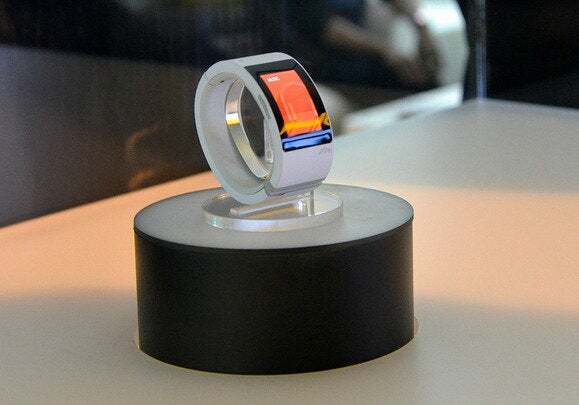 Yes, it can work as a smart watch and a smart mobile all without any sort of wires or wireless connection. PULS also has GPS, music player, fitness tracker along with popular social network apps. AT&T in the US, offers a mirrored SIM, which can be used in your mobile and PULS simultaneously. So you can actually have the same number in both these device and afford to leave your mobile at home. The company i.am+ also has a jacket powerbank, a backpack sound system and shoes to track your steps. All these device hook on to the PULS and help you keep track of yourself. At this moment, we have no clarity on the pricing, availability or even the operating system. But I do think that this is a cool device to wear and a smart phone that is smart and a phone on its own.